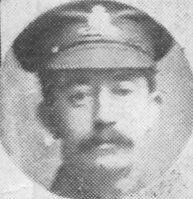 At the age of 32 William Powell attested under the Derby Scheme on 22nd November 1915. He gave his home address as 3 Greenhill Cottages, Poolbrook Common. He was mobilised on 1st June 1916 and served at home until 23rd March 1917, for the majority of time with “B” Siege Depot, Bexhill. On landing in France he was posted to the 1st Army Pool and finally 211 Siege Battery on 18th April 1917. The ” Two Elevens,” were formed at Falmouth in 1916 out of Cornish Territorials, and drafts from Scotland, Birmingham, London and other centres. They served in France and Belgium; supporting at the Battle of the Ancre, and helped to capture Vimy Ridge; serving in the Salient; enduring the Retreat; later advancing with the Fourth Army to capture the Hindenburg Line; and finally to reach Le Cateau on the day of the Armistice.